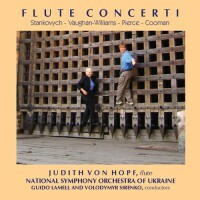 Flute Concerto (2006) was commissioned by flutist Judith von Hopf and the Kiev Philharmonic and premiered by them under the direction of Guido Lamell. The work is in two movements: Chanson and Fantasy Variations. The opening theme is declamatory and massive. The first variation is fast and limber. The second variation is introspective and stratified. The third variation is fleeting. The fourth variation is distant and spare. The fifth variation is fast and driving. The final theme begins whispered and slowly regains its declamatory nature before a brief and intense coda ends the work in a blaze.